As you can see from the map on the right, we are in the centre of major routes North-South and East-West, just off the A9 major trunk road. Take the A9 south. Turn off at Kingussie. turn right onto A86 to Kingussie and Newtonmore. At the western end of the Main Street in Newtonmore the Museum sits astride the junction of the A86 and B9150. The Car Park is entered from the A86 behind the Museum. Take the A9 north. Turn off at Newtonmore. follow B9150 into Newtonmore. As you enter Newtonmore the Museum is just past the petrol station on the left. To access the car park turn left in front of the Museum onto the A86. Take the A86 east. Enter Newtonmore. as you approach the junction with the B9150 look out for the car park on your right. We offer free parking for cars, small coaches and bicycles in the Museum car park. Roadside parking is also possible. 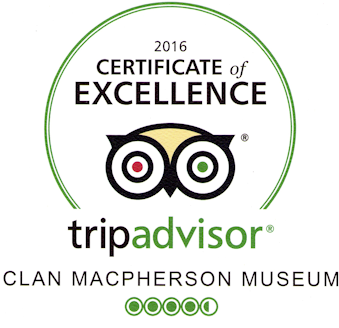 For information about accessibility at Clan Macpherson Museum and to arrange assistance, please contact us. Sustrans National Route 7 Cycle route (www.sustrans.org.uk), part of the famous Sea to Sea (C2C) cycle route runs passes the Museum. 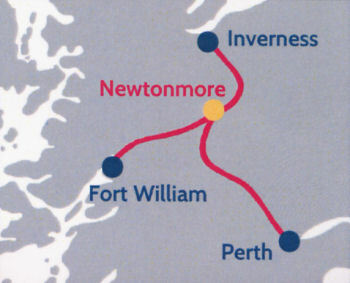 Train services run from all parts of the United Kingdom to Newtonmore. They run 7 days a week. To check times of all train operators see the Traveline link below. Newtonmore Train Station is roughly half a mile from the Museum. The gentle 10 minute walk sets out north along Station Road, after a third of a mile turn right past the petrol station. The Museum will be seen shortly after you pass the petrol station. There is no taxi Service. Bus services operated by National, Citylink and Stagecoach run regularly from Edinburgh, Glasgow, Perth and Inverness to Newtonmore. The bus stops are outside the Museum. Buses run 7 days a week. To check times of all bus operators see the Traveline link below. To check train and bus times from all operators use the Traveline Scotland web site.